We are very excited to be joined by Joanna Fagan (soprano), Paula Kilmurray (soprano) and Miriam Blennerhassett (alto), all amazingly talented Mullingar-based artists, and we are delighted to welcome back Owen Gilhooly (tenor) and Adele O’Dwyer (cello) to perform with us once again. Listen to a clip below of “Christus Factus Est” from the first performance of our 50th anniversary season! Gloria! 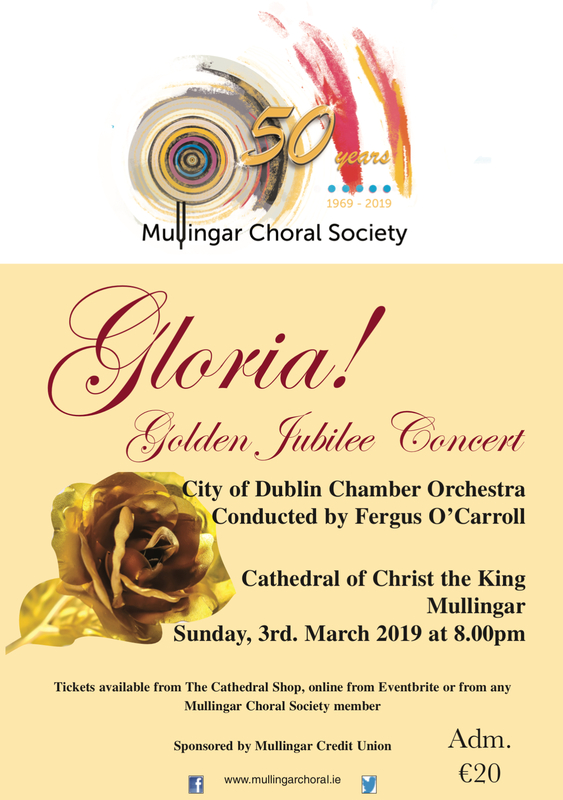 Golden Jubilee Concert: Sunday, 3rd March 2019 at 8pm, Cathedral of Christ the King, Mullingar. Rehearsal, Sunday, 2:30pm sharp in the Cathedral.